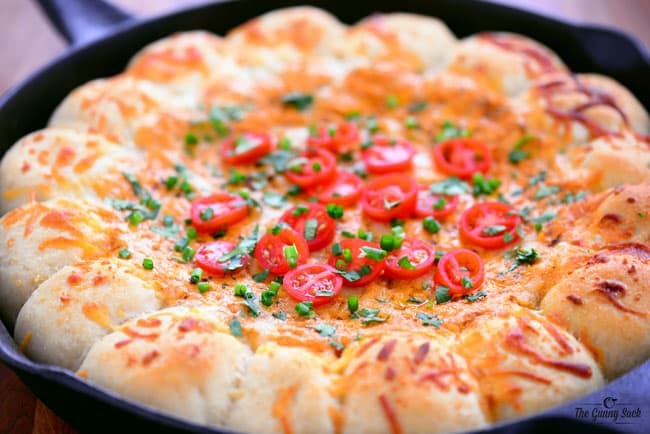 This appetizer recipe for Chili Cheese Skillet Dip with Garlic Cheese Bombs is perfect for serving at parties! I’m sharing it as part of a sponsored post for EVITE® and HORMEL®. We love spending time with our family and friends, whether it is at our house or at theirs. Whenever we get together, food is always involved. The menu options change depending upon the occasion and the time of the day, but one of my favorites is the appetizers. If I know there are going to be appetizers available, I am likely to skip dinner to leave plenty of room for the delicious food. 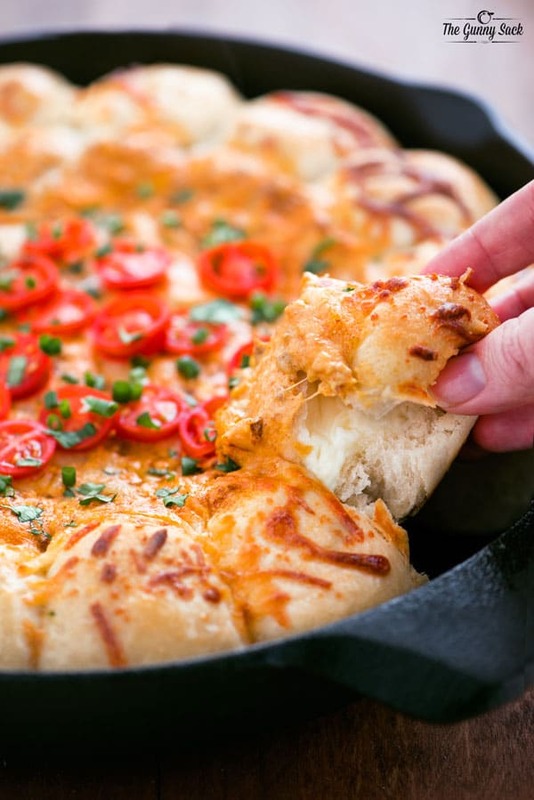 This chili cheese skillet dip with garlic cheese bombs is a new family favorite and we can’t wait to share it with our friends because we know they are going to love it as much as we do. Start by making the dough for the garlic cheese bombs. Dissolve yeast, sugar and salt in warm water. Stir in the flour and knead until smooth and elastic. (I let my stand mixer do the kneading and it took about 5 minutes with the dough hook.) 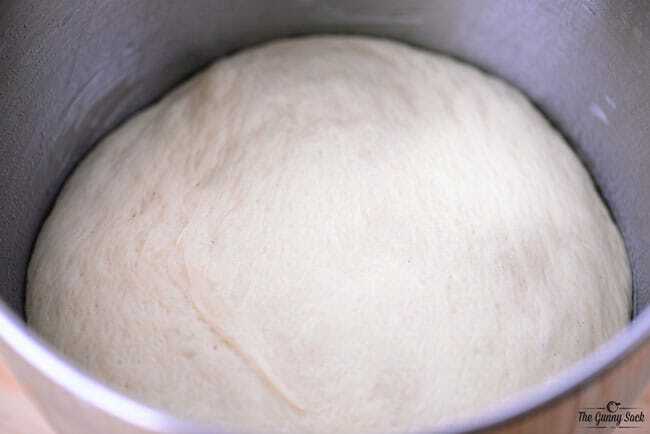 Place dough in a well-oiled bowl and turn the dough to coat it with oil. Cover the bowl and let the dough rise for one hour. 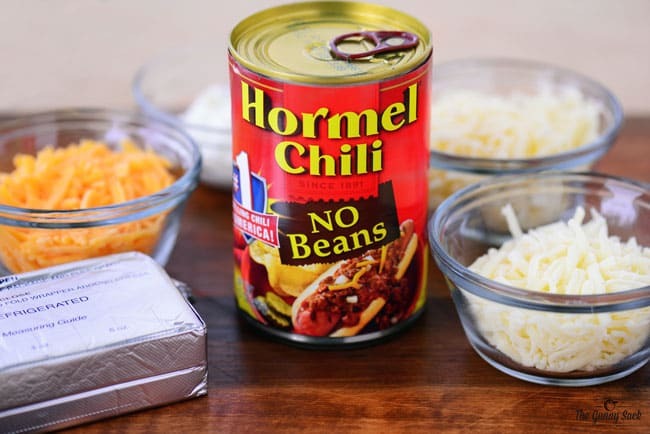 The dip is very easy to make with HORMEL® Chili No Beans because the chili is cooked, seasoned and ready to go! You will also need cream cheese, shredded Cheddar cheese, shredded Monterey Jack cheese, shredded mozzarella cheese, and sour cream. Beat the softened cream cheese. 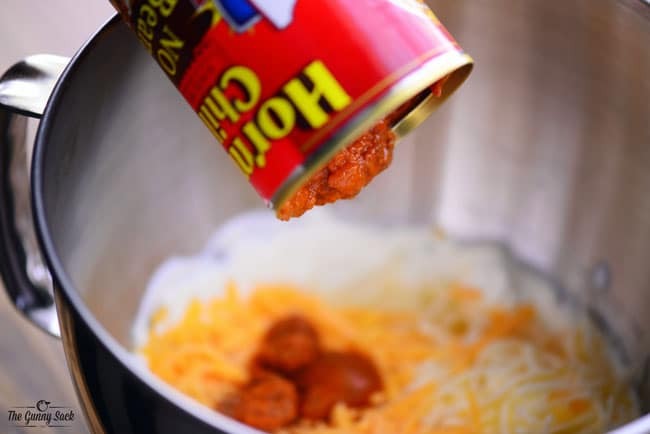 Add the shredded cheese, sour cream and one can of HORMEL® Chili No Beans and stir until combined. Set the mixture aside. 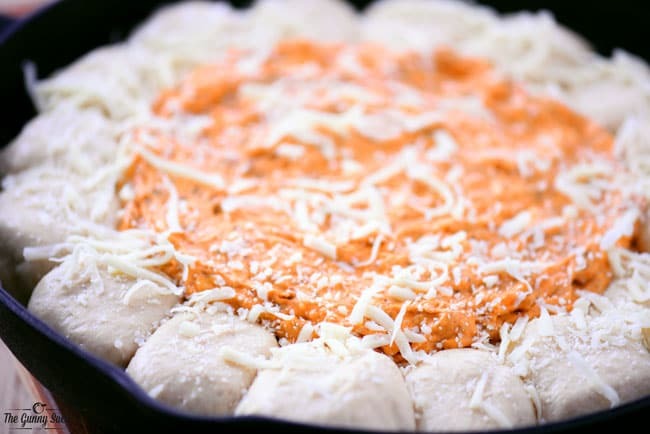 Bonus Tip: If you want to make the chili cheese skillet dip without the garlic cheese bombs, skip making the dough and just spread the chili cheese mixture in a greased, oven-safe skillet at this point and bake at 400 degrees for 20-25 minutes. Enjoy with tortilla chips! Cut the dough into 16 pieces and cut 16 pieces of cheese. I used soft, processed queso blanco flavored cheese but mozzarella would work as well. 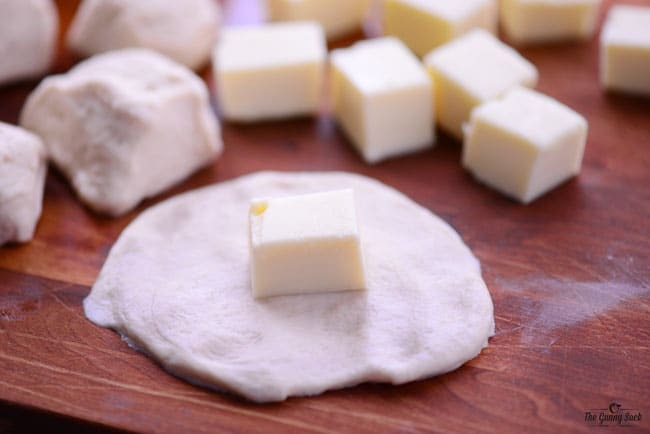 Wrap one piece of dough around each square of cheese. 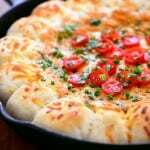 Put the cheese filled dough balls around the edge of a 12-inch greased, oven-safe skillet and brush with melted garlic butter. Spread the chili cheese mixture in the center and sprinkle with shredded mozzarella cheese. Bake at 400 degrees for 20-25 minutes until golden brown. Sprinkle the chili cheese dip with tomatoes, green onions, and cilantro. Serve while still warm. Grab a garlic cheese bomb and use it to scoop up the chili cheese dip! 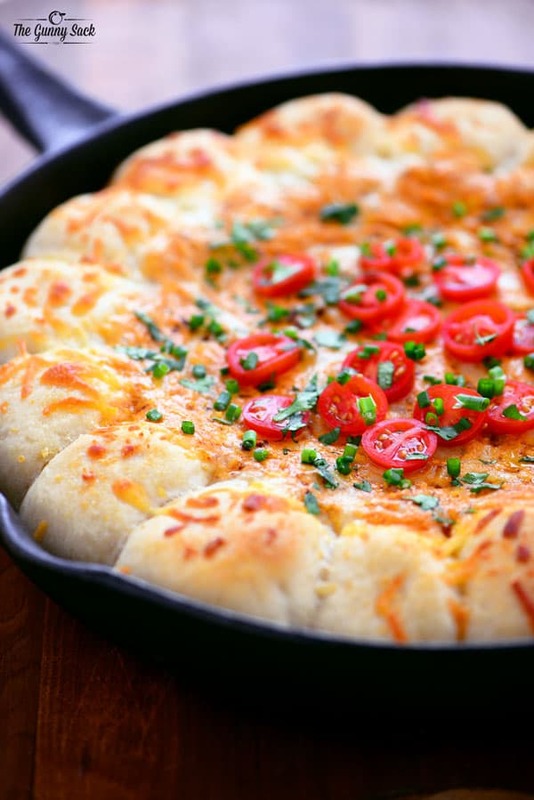 This appetizer recipe for Chili Cheese Skillet Dip with Garlic Cheese Bombs is perfect for serving at parties. It’s easy to make with HORMEL® Chili No Beans, full of flavor and cheesy goodness. Dissolve yeast, sugar and salt in warm water. Stir in the flour and knead until smooth and elastic. Place dough in a well-oiled bowl and turn the dough to coat it with oil. Cover the bowl and let the dough rise for one hour. Cut the dough into 16 pieces. Wrap one piece of dough around each square of cheese. Put the cheese filled dough balls around the edge of a 12-inch, greased, oven-safe skillet and brush them with melted garlic butter. Beat the softened cream cheese. Add the chili, 1/2 cup shredded mozzarella cheese, shredded Cheddar cheese, shredded Monterey Jack cheese and sour cream. Stir until combined. Spread the chili cheese mixture in the center. Sprinkle with 1/4 cup shredded mozzarella cheese. Bake at 400 degrees for 20-25 minutes until golden brown. Top with tomatoes, green onions, and cilantro. Looking for more appetizers? Check out this EVITE® recipe for Chili Cheese Fries. Tonia, my niece and nephew would love this. My bro’s birthday is coming up and I just might have to attempt this. OMG! This looks so appetizing! What a perfect appetizer for parties! I love the garlic, chili and cheese combo! I could dig right into this! It looks fabulous! Holy cow! I need this in my life, they look amazing! This looks so very fabulous. I think I would eat the whole thing. Oh. My. Gosh! This is one heck of a appetizer! Love all that chili and cheese…yum! Bring on the dip! This looks great! Thanks Emily! My kids couldn’t get enough of them!